An orchestrated clang, then a thud, then me standing up getting a breather, followed by another clang of the plates rising from the ground, thud of their being dropped on ground and me standing tall between reps soaking in as much air as my diaphragm allowed before the mechanical cacophony kept on as an invigorating exercise. As I performed the deadlift with a reset between reps, I could almost see everyone around me in that open air gym including the trainer look at me questionably with slanted eyes. Very obviously, they needed answers. "Rahul, I thought you knew how to deadlift..."
"Isn't the bar supposed to never leave your hands until the set is done?" "Hey dude, you are never going to get the guns like this." Well, suffice to say, the growing body of concern that day surrounding my deadlift technique that can be uncommon in today's gym culture needed to be addressed. We have two approaches to execution of heavy deadlifts. The continuous Deadlift Set: Or where the bar is never let go of. Great as a part of a Barbell Complex or any other hypertrophy scheme where the time under continuous tension is the utilized factor for progress. However, a key drawback to using time under continuous tension with the deadlift is the fact how much before your big boy muscles from the back and legs even feel the first signs of discomfort, your ancillary muscles like the grip and even the spinal erectors may make a bad face asking for rest. The result is a near crappy spinal arch on almost every next rep after the third or fourth one, on especially heavy weights. The reset deadlift is like a series of singles done in a very compact fashion. The lifter performs a tight and tense deadift rep, then when the rep completes, the bar is parked by the feet and the lifter then stands and takes a deep breath. And without wasting another moment, goes down in as crisp a form as on the first rep and performs a rep again. You can actually lift more weight this way. I initially thought that letting go of the bar would not be a big deal for training the grip. 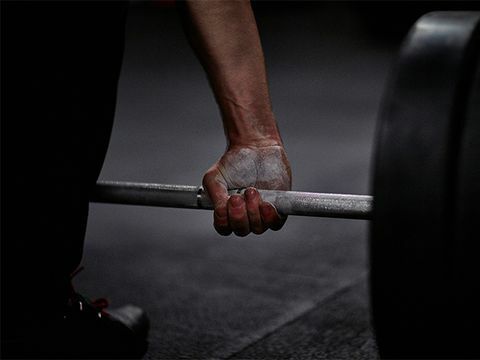 On the contrary, I found the act of unloading and then re-gripping a very heavy barbell while deadlifting, again and again to be an altogether new form of challenge for the hands. It also allows for complete wrapping and resetting of the hands around the bar, allowing for a better application of the force to the barbell, instead of a marginal leakage of the force as what happens while you are fighting to keep your pinky fingers still have the bar on them before it rolls off on the 10th rep. My hands felt tougher doing the reset deadlift reps from dead stops for huge volume. Reset deadlifts are a great choice to include in high volume deadlift programs. Again, the absence of potential risk for form damage and injury are key. This doesn't mean you should quit the continuous deadlifting and acquire reset deadlifts completely. Like most strategies to get stronger, this one has a time and place as I highlighted. However, it would not be a bad idea to always deadlift while resettting between reps in order to deadlift injury-free and pain-free for the rest of your career. Give them a shot. And let me know how they worked for you.